Never heard of them. Amazing really, considering their lengthy career, and the number of albums they’ve punted out, but then there are so many metal bands out there, it’s easy to let a folk / black metal band from Germany slip through the net. However, that has finally been put to rights with the arrival of “Eternal Defiance”. Apparently, this eleventh album shows a stylistic change with the advent of orchestration, but how would I know? What I do know is that’s pretty damn good. Even if the concept of a German metal band utilising bagpipes seems highly bizarre to a full blown Scotchman. Seems the lineup has always been a flexible one, with mainman Arkadius Antonik (probably not his real name) the only constant in their 20 year history, and this one sees him aided by guitarist Tim Siebrecht switching to bass alongside new guitar player Marius ‘Jussi’ Pesch, as well as female vocalist Tina Stabel and bagpipe player Axel Römer. The words they’re singing, however, come from the pen of one Kris Verwimp, who is best known for the oodles of cover art he’s done for metal bands over the years. Here, he’s penned a tale inspired by a Welsh folk tale called ‘The Dream of Macsen Wledig’. In case you don’t know, the historical figure Magnus Macsenus or Magnus Maximus became the basis for a number of Welsh and English legends and according to Geoffrey of Monmouth he was king of the Britons following the death of Octavius, during the reign of Emperor Constantine I. Education out. Over on the musical front, it’s certainly all guns blazing as the band launch into a bombastic instrumental, ‘Storming The Walls’, which will please fans of movies like ‘Ironclad’ and ‘The Black Death’, before the album proper kicks of with ‘Inner Sanctum’. It’s ferocious stuff, which works best when you get vocal interplay, as on ‘Beneath The Red Eagle’. heuchter teuchter type folk will take delight in ‘Pair Dadeni’, with the only lowlight being the mainly acoustic ‘The Mindsong’. Now I know what they were going for, but it’s not really their thing, although fans of Renaissance rock will enjoy Fortunately, there are plenty goodies ahead with ‘Dragon’s Head’ the best of the bunch. 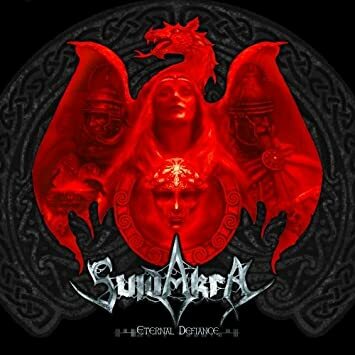 When they do full on epicus metallicus, SuidAkrA are as good as anything I’ve heard in years. Pure mental, so it is. The limited edition comes with one extra song, an in the studio video and an animated video for ‘Storming The Walls’.